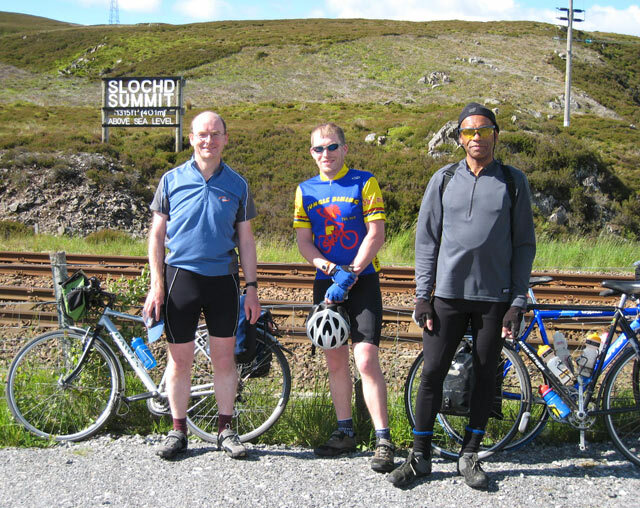 Our fourth long-distance bike ride (now established as an annual event) took place in July 2007. 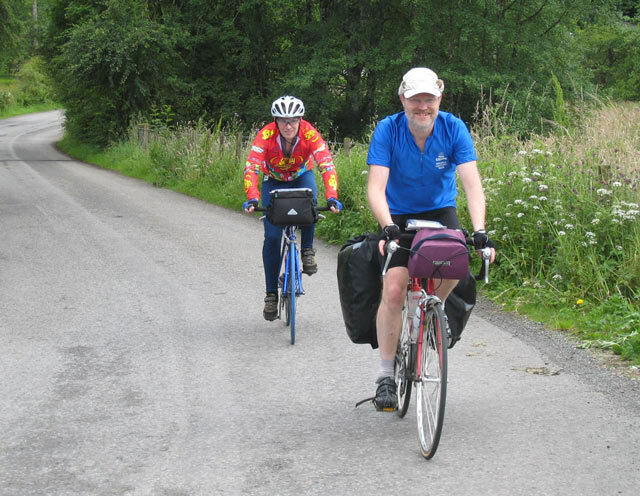 The route chosen (by Paul as always) was from Glasgow to Inverness, largely following National Cycle Route 7. The route has been branded as "Lochs & Glens North" by Sustrans, and a map is available from them. Participating numbers were slightly down compared to previous rides, partly due to other commitments and partly down to the extra distance required travelling to and from the start and end points. There were five of us on this ride: Paul (Veggie), Ian, Andy, Greystone and myself. Whereas I was content to end the ride at Inverness, the others planned to carry on further using NCN1 - Ian would continue to Forres, and the other three would carry on all the way to Aberdeen, a total of 350 miles over 5 days. My own mileage would be a mere 216 to Inverness, according to the official route mileage, achieved over 3 days (though two of those were effectively only half days). We all travelled by train from York to Glasgow on the morning of Day 1, which was the first Saturday in July. As always with these rides, we couldn't all travel together due to the limited cycle accommodation on British trains, so Paul volunteered for the early start on the 7.37 departure, and the rest of us followed on the 8.27. Our journeys were punctual, and we met up at Glasgow Queen Street station at 12.00. As we were preparing to set off, Greystone realised that he had left his helmet on the train, which was now on its way back to Edinburgh. He reported the loss, with the hope of collecting it later, and we set out from the station at 12.30. We had to negotiate the busy streets of Glasgow City Centre to reach the riverside cycle path, and this took us to the official start of the route at Bell's Bridge, by the Scottish Exhibition Centre. The first few miles from here follow a tortuous route, with bits of roadside cycle lanes, detours down side streets, traffic signals, barriers and "cyclists dismount" signs. This is all to keep cyclists separated from heavy traffic, but the result is that it takes twice as long as it would have done on the the road. To be fair, there is a new riverside cycle path under construction, which should avoid all this when it opens. Six miles into the ride, on a stretch of former railway near Yoker, I claimed the first puncture. I was a victim of that scourge of suburban cycle routes, broken bottles. Beyond Clydebank the route improves, following the Forth & Clyde Canal as far as Bowling. With hindsight, we should have taken the train to Dalmuir, which would have saved us about an hour, and avoided the tedious journey through the Glasgow suburbs. 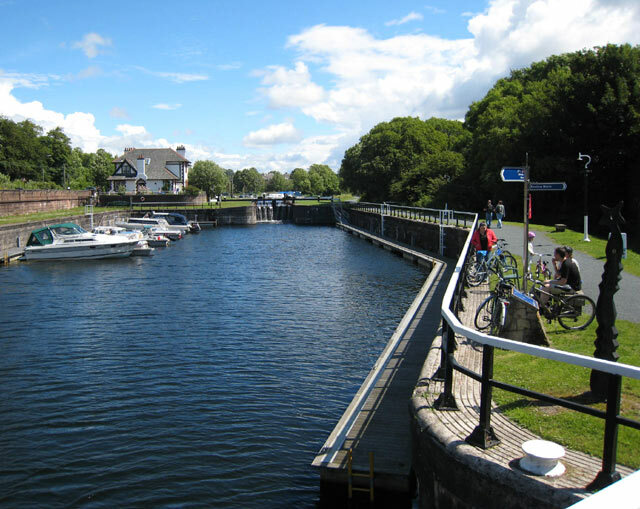 We pressed on through Dumbarton, where the route picks up a riverside path along the River Leven to Balloch, at the southern end of Loch Lomond. After passing through Balloch Castle Country Park, we emerged onto quiet country roads, and it was a real pleasure to be able to get up a bit of speed at last. Just before Drymen, we turned onto a stretch of old railway, which crosses Endrick Water on a re-constructed viaduct, with a new deck much narrower than the original. The final roads into Drymen were familiar to me, as they are also on the route of the West Highland Way, which I had walked in 2001. We had a tea break in Drymen, at the pottery. It was 4 o'clock, and we had covered less than half the distance to our overnight stop in Killin, so we decided to omit the section through Achray Forest to save some time. The road out of Drymen gave us our first serious hill climb, a 3-mile slog which allowed Greystone to disappear way out in front. We re-grouped at Dalmary Lodge, and continued together through Gartmore. About a mile before Aberfoyle we departed from NCN Route 7, and took the A81 to Callander. The road was not too busy, but there was another hill climb which got us all separated again, with Greystone out in front as always, and Paul, unusually for him, struggling at the rear. We paused for a short break in Callander. 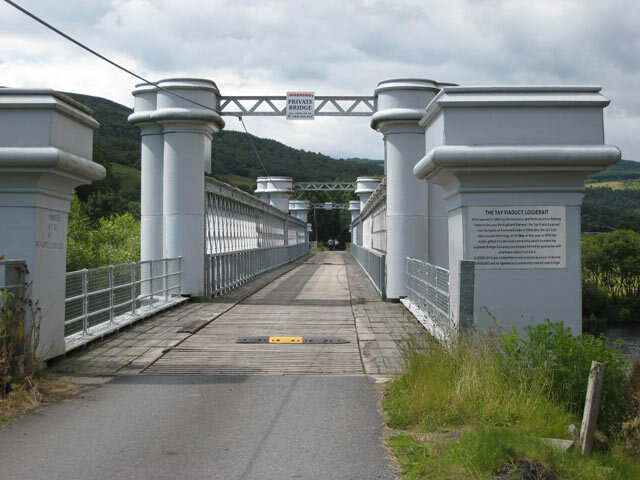 From Callander, back on the signed cycle route, we followed the course of an old railway alongside Loch Lubnaig. Greystone got a puncture on this section, which delayed us for a short time. There was a very steep section which got me into bottom gear for the first time on this ride, just before Strathyre. We missed out the detour through Balquhidder, by using the A84 for a couple of miles, then took the steep zig-zag track (bottom gear again) to regain the old railway high above Lochearnhead. This is a spectacular section, as the railway climbs high above Glen Ogle to a summit just before Killin. The last few miles were thankfully downhill, and we arrived in Killin at 8.45. Our first priority was to eat, but we were disappointed to find that the pub (Coach House Hotel) had stopped serving dinner. We were saved by a fish & chip van, run by two large, jolly ladies. Paul had gone to the youth hostel to cook some veggie dinner for himself, but instead was served a meal by some Swedish girls who had cooked too much for themselves. We returned to the pub, where North Sea Gas were performing live music. Paul was worried about his lack of fitness, and wondering how he would cope with tomorrow's climb to Drumochter Pass. Sunday morning was pleasantly warm, with blue skies and fluffy white clouds as we set off from Killin at about 9.30. We had over 90 miles to cover today, but all day to do it in so there was less time pressure than yesterday. 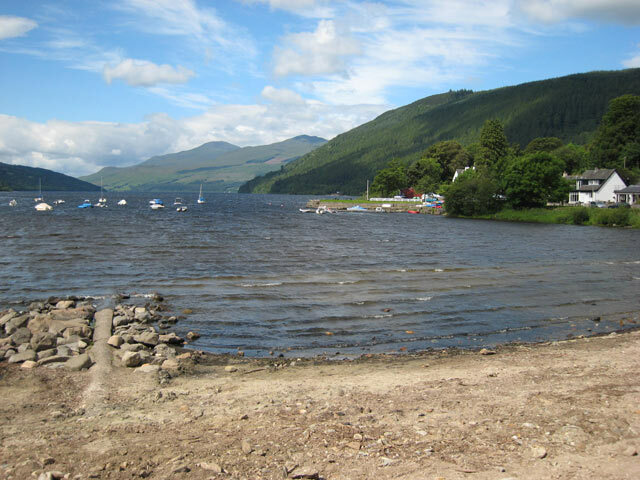 We began with a very enjoyable ride on a minor road along the south side of Loch Tay. There was almost no traffic, and the gently undulating road made for some excellent cycling. At the end of the loch we passed through Kenmore and continued on the B846, a level road but very fast with a following wind. There was a stop for morning coffee/tea at Weem. We continued following the River Tay downstream as far as the old railway bridge at Logierait. From here we took the minor road on the west side of the River Tummel to Pitlochry, entering the town via the suspension footbridge over the river. It was chip butties all round for lunch, at Macdonald's fish & chip shop. Heading northwards out of Pitlochry, Ian noticed his back tyre was becoming soft, but decided to just put some more air in it for now. There was a gentle rise up to the Pass of Killiecrankie, then a descent to Blair Atholl. This was the start of the day's main challenge - uphill for the next 18 miles to Drumochter. The gradient is not steep - the main railway to Inverness follows the same route - but it is unrelenting, and there is no chance to freewheel for a few minutes to rest your legs. The cycle route makes use of the old A9, which has largely been rebuilt on a new alignment, and our speed gradually fell from an initial 9-10mph, down to around 7mph as the gradient and the adverse wind (we were now heading northwest) took their toll on our legs. Paul was struggling again, and he blamed it on a recent chest infection which he had not fully recovered from, and a lack of training runs for the same reason. Just before the summit, Ian's tyre went flat again, and he decided it was time to change the inner tube, so that gave us all a chance to rest our legs. We eventually reached the summit (462m, 1516ft) and paused for photographs. This is the highest point on the National Cycle Network in Scotland. For the next few miles, we could relax and let gravity do all the work. The first bit is on a purpose built cycle track, and the surface was not good enough to allow unrestrained speed, but the last mile into Dalwhinnie was on a good road (the A889) where we could release the brakes and let fly. A café in Dalwhinnie provided a very welcome tea stop (with toasted teacakes and jam, yummy!). The rest of the way to Aviemore was much easier, either level or gently downhill, through Newtonmore and Kingussie. We called at the Co-op in Kingussie to stock up on provisions for tomorrow's breakfast, then took the minor road which parallels the A9 to Aviemore, instead of the signposted route via the slightly hilly B970. We arrived in Aviemore, exhausted, at 7.45, and checked in at the Old Bridge Inn bunkhouse. 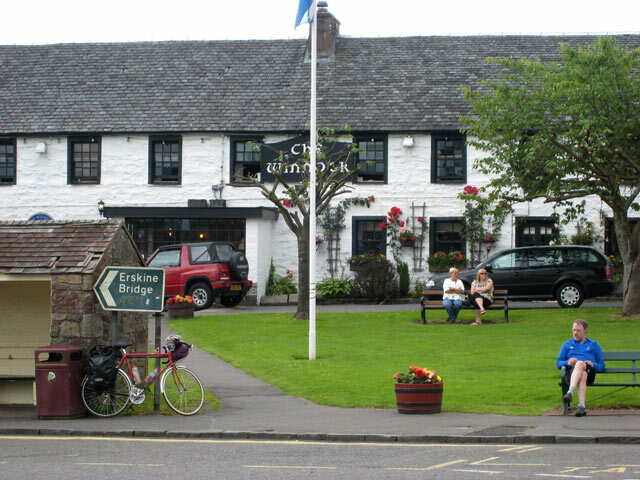 After getting showered and changed, we convened in the pub for a well-earned drink (mine was Caledonian 80/-), and discussed options for dinner. The majority vote was for an Indian at the nearby restaurant, and very good it was, too. We were all too tired to have another drink in the pub, so it was early to bed. We needed to be up a bit earlier this morning, as I wanted to catch the 12.40 train from Inverness. Sticking to the NCN route would be 41 miles, but we could save a few miles by going directly to Carrbridge rather than via Boat of Garten, and this is what we did. We got away by 8.50. On the gentle rise towards Carrbridge, Paul was lagging behind again, and this time it was his knees that were the problem. He was in some pain, and there was no way he would be able to endure the climb up to Slochd Summit. He reluctantly abandoned the ride at Carrbridge, and went to the station to wait for a train to Inverness. He was hoping that he would be able to continue from there, over the more level route to his planned overnight stop at Forres. The rest of us now began the ascent to Slochd, using the minor road which used to be the A9. It's not as high as Drumochter, being 'only' 401m (1315ft), and the length of the ascent is only 4 miles, so it wasn't too painful despite our tired legs. We posed for photos at the summit, adjacent to the railway. Soon after setting off again, a northbound train passed us, with Paul on board. We made rapid progress from here, onwards through Tomatin and Daviot, with some fast downhill stretches. By now I was confident that I had plenty of time in hand, so when we came to the Clava Cairns, a bronze age burial site, we had time for a short break and a look around. It was here that I parted company with Ian, Greystone and Andy, as they took Route 1 eastwards towards Nairn and Forres, while I continued on Route 7 to Culloden. I must have missed a signpost here, as I ended up on the busy A96 into Inverness. I arrived at Inverness station at 12.00, and found Paul there. He had given up hope of any more cycling today, and was catching a train to Forres, hoping that he would be fit enough to continue tomorrow. I had time to call in at Marks & Spencer's to buy a sandwich and a bottle of beer, to have as lunch on the train home. With a change of trains in Edinburgh, I was back in York by half past seven. It had been another good ride, with fine weather, good scenery and good company. I'm sure there will be another in 2008.